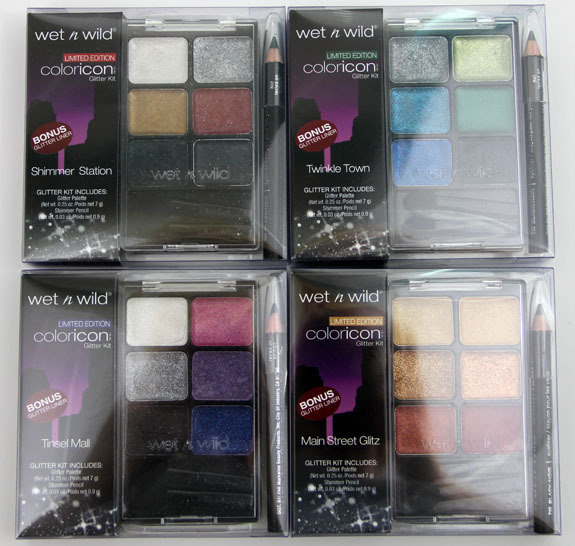 Wet n Wild keeps the holiday shimmer going with their new limited edition Coloricon Glitter Palettes. There are four different palettes this holiday which are: Shimmer Station, Twinkle Town, Main Street Glitz and Tinsel Mall. These are creamy glitter shadows so the texture is a bit different from what we have been seeing from them as of late. And as you will see, some worked and some…well didn’t. The issue I seemed to have with a couple of these palettes was that there was SO much glitter sitting on top of the creme shadow, all I could get onto my finger was glitter. The glitter and creme didn’t seem to mix well together. The shadows felt very gritty and came out super patchy. But not all of them were like that so I’m not sure what the deal is. Maybe not enough quality assurance at the factory? They all come in a box like this with the palette and a short glitter eyeliner included. These are regular palettes with the lids attached. Yay! The negative though is that the palette names aren’t listed on the palettes, only on the plastic packaging that will inevitable get thrown away. Main Street Glitz features some festive golds, oranges and and metal-like colors. Of all four of these palettes these shadows were the most opaque, even and easy to swatch. They felt soft and creamy and while they are glittery, they don’t really feel gritty or weird. Super shimmery and fun! Shimmer Station was for me the second best one here in terms of quality and payoff. Love that antique gold color and the black with multi-colored glitter. The red was really nice as well. The only overly glittery one I found was the silver and it was patchy and gritty. Tinsel Mall features cool toned shadows and I had MAJOR issues with almost all of these. The exception was the white one, which had the least amount of glitter sitting on top and was creamiest. The other colors had tons of thick glitter on top of the creme so getting them even was nearly impossible. I tried and tried but to no avail. You can see how uneven these are. Bummer because the colors themselves are really pretty! Twinkle Town is another cool toned palette with blues and greens. I had problems with about half of these as well. The last three had less glitter and came out more even. Especially that dark green, it was fabulous. But the two blue colors did NOT work!!! I am really on the fence about these. While I really want to like them I don’t think they worked that well in actuality. The two that did work the best were Main Street Glitz and Shimmer Station, but the other two were total fails in my book. I don’t know if I just got a bad batch or what, but the quality of these shadows didn’t seem even across all palettes. I have not worn them on my eyes so I cannot speak to creasing issues yet. Availability: Limited edition at drug stores. What do you think about these? Will you be checking them out? Ah D: I was afraid they’d have a consistency like you described. I’m never been a fan of any cream products that were so pressed hard into a pan (Bobbi Brown Pot Rouges). When it comes to cream products, I feel better when they’re in glass jars! I still may pick up Twinkle Town though! How disappointing! Tinsel Mail looked so pretty! I just want the green half of Twinkle Town! Love the dark green, and the glitter in the black seems amazing! Figures, the one I’d get looks awful. Oh well. Oh, those swatches are disheartening 🙁 Thank you so much for saving me cash and frustration! I was really looking forward to Tinsel Mall. 🙁 Too bad it’s a fail. Chris´s last post…Your Earliest Makeup Memory? They looked pretty in the pans, but the extreme patchiness and the gritty texture you mentioned are total fails in my book. Nobody wants grittiness near their eyes, especially – how painful would that be if you got some in your eye? Yikes! I would probably just use those as creme eyeliners. I would also try just scraping off the top glitter layer because some colors are creamy benieth all that chunky glitter. I got a palette and I noticed the same. Hope this helps. This is the first Wet n Wild product I haven’t been excited about in awhile. I actually saw a display of these(why couldn’t it be a different collection?!) and passed on it. Oh well, they can’t all be zingers (Primus reference, yay!). Les Claypool would be proud! Tinsel Mall is a disgrace. I’m getting all the others to use as bases. I think these are OK.
I’ve been wondering if these are just like the WnW Fantasy Makers Halloween palettes. It looks like they are. I wish the glitter was interspersed throughout the cream shadow. It’s weird that it’s just a layer of glitter sitting on top. Now that I’ve seen good pictures and swatches, I’m going to have to pass on these. I was wondering that exact thing! And I agree- it does look like they are the same- too bad. They aren’t coming home with me, either. Pity about the quality- ’cause these colors are awesomesauce. This look like last year’s Halloween creme shadows and they were fails for me. WnW’s creme shadows do not work for me. And, I’m sad about that too because there are some great colors in these palettes. I wonder if you could mix the glitter in better? Probably more trouble than it’s worth, especially if they’re gritty on top of everything else. Scraping the glitter off like Eve suggested sounds like the only viable idea- and if they’re going to get tossed anyway- why not give it a whirl? your not the only one with the same problem, I have seen other bloggers showing this and it looks too patchy, makes me sad cuz looks pretty but fail! Love the colors of Main Street Glitz. The rest are alright. I don’t really care for creme shadows. Anxious to see them swatched. Disappointing! I’m not a huge fan of cream shadows as it is, but after seeing this, I’ll definitely pass. I really like WetnWild eyeshadows, but I’m not really have fan of cream shadows, they just don’t work well with me. SO I think I’m going to pass of this collection. Have not seen the shadows, but the coloricon glitter polishes were at Walgreens today. I almost bought one of these today (glad I didn’t) but insted I bought the wet and wild new all matte palette. I get pretty iffy about cream shadow anyways because, it’s my experience, that even if they go on evenly that they tend to crease. Cathenia´s last post…They’re waiting for you…Picture trades.